All items on this page are available for immediate purchase and ship. Please contact us via phone or email if you might be interested. Below: Nice little pocket knives. About 2 7/8" when closed. 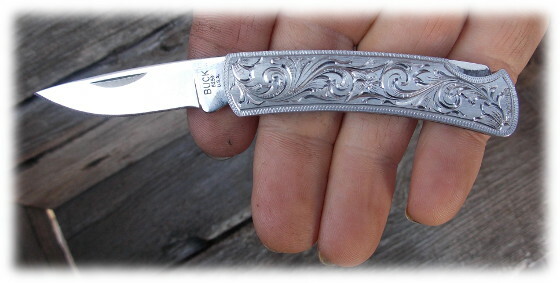 Made in the USA by Buck knives. Hand engraved by Gary Wiggins. $185.00 each plus shipping. 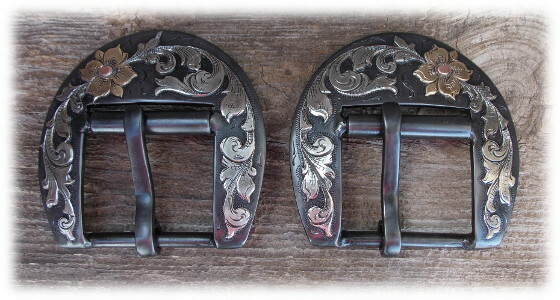 Below: 2 inch back cinch buckles. $525.00 pair plus shipping. Below: Buckle made out of jewelers bronze base, overlaid with sterling and jewelers bronze motif. $485.00 + shipping US. Left: 3/4 inch steel heel buckles and keepers. German silver, copper and jewelers bronze overlay. $250.00 for the pair plus shipping. SOLD - Thank You Charles! Left and below: These spurs where made for the Women's Protective Service Spur Show & Auction held on June 25, 2011 in Lubbock, TX. SOLD - Thank You to our Canadian friend Dave! 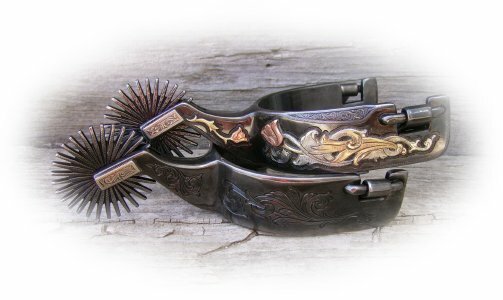 Below: These are the spurs I made for the Trappings of Texas show in Alpine. 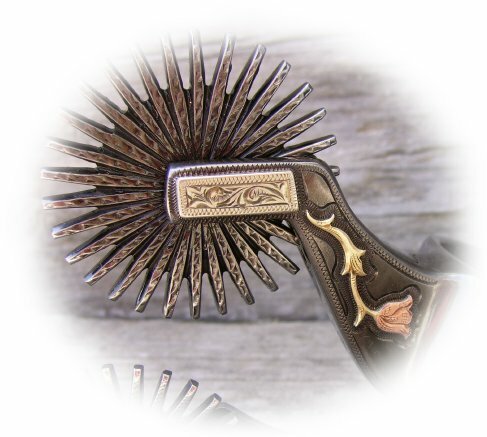 The outside of these spurs have an over-laid rose over star design. The rose is made of yellow jewelers bronze with silver stem. The center star is copper and the 2 smaller stars are red bronze. 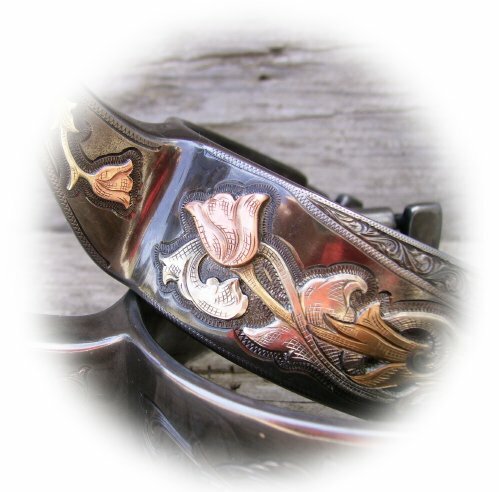 The off side of the spurs are all steel engraved as well as the inside of the bands. The heel bands measure 1 1/4" with engraved bevels, the rowels measure 2 inches. SOLD - Thank You Deanie!